Tucked into a few spots of the garden. I love the upright sprigs of this flavorful herb. rated down to Zone 5, hoping I can cheat the cold. Great head to accompany the photo with the double meaning and all. Glad you liked it! Our Zone 4 is becoming Zone 3 with this COLD! Mine have weathered winter quite well (same zone). 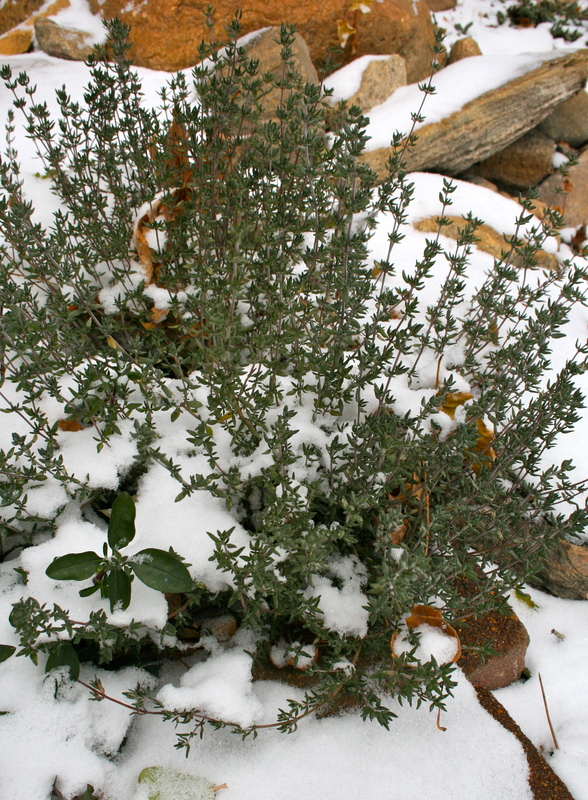 Eliza, thanks for letting me know that…all the other Thyme is very cold hardy here, but the German Thyme is new this year. Record cold in November, not making me happy! I hear you – it is the gray skies that are getting to me. I miss the blue sky and sunshine. I live for the sun! My daughter Lucy has a new friend at school, named Eliza! I love it! Stay warm, might be 40 degrees on Sat, with more snow coming right after! I don’t like it one bit! I will enjoy the warmer temps. this weekend, knowing full well what will follow in on its heels. I’ll take any break in the weather I can get!